Jim Vieira and Hugh Newman have been working together investigating Native American stone and earthen constructions, Native oral history and the giant skeletons of North America for nearly ten years. They starred together on the History Channel TV show Search for the Lost Giants (2014) and have recently co-authored Giants On Record: America’s Hidden History, Secrets in the Mounds and the Smithsonian Files (2015). Jim and his brother Bill also starred on the recently aired History Channel special Roanoke: Search for the Lost Colony (2015). Jim is a stonemason and lives in Ashfield, Massachusetts. Hugh is an explorer, antiquarian and author of Earth Grids: The Secret Patterns of Gaia’s Sacred Sites (Wooden Books 2008). He has several articles published on Ancient Origins website and has been a regular guest on History Channel’s Ancient Aliens. He lives in Glastonbury, England. in the territories of their forefathers. All over what is now the U.S.
Map of giant reports in North America. Smithsonian scientists identified at least 17 skeletons that stood at over seven feet in their annual reports, including one example that was 8 feet tall, and a skull with a 36-inch circumference reported from Anna, Illinois in the Smithsonian Annual Report of 1873, (an average human skull is about 20 inches in circumference). The Smithsonian Institution is mentioned dozens more times as the recipient of enormous skeletons from across the entire United States. The skeletons mentioned no longer seem to exist regardless of their actual size, and the remaining ones that were on display were removed and repatriated by NAGPRA (Native American Graves Protection and Repatriation Act). While the authors certainly support this law, it does present a moral and ethical conundrum in terms of trying to ascertain the proof everyone wants to see – physical evidence of giants. 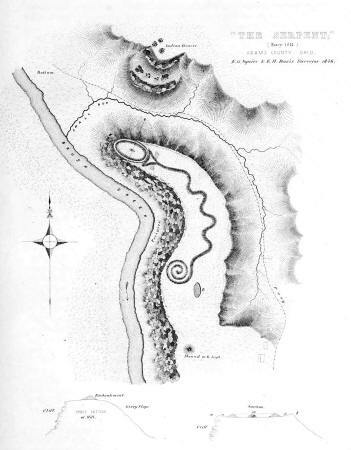 Serpent Mound survey by Squire and Davis. The Great Serpent Mound is a 1,370ft long prehistoric effigy mound located near Peebles that has been thoroughly researched by Ross Hamilton, who has written extensively about its mysteries and the giants discovered in the area. Recent radiocarbon analysis dates it to around 321 BC. This puts it in the realm of the Adena civilization who were present in the area at this time. 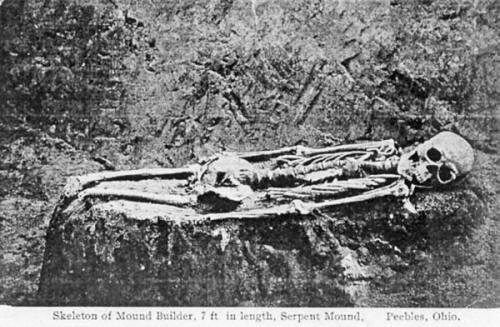 In the 1890s, Professor Frederic Ward Putnam excavated some of the mounds next to Serpent Mound and found only 6ft tall skeletons, but a postcard showing one 7 feet in height was recently rediscovered by researcher Jeffrey Wilson. 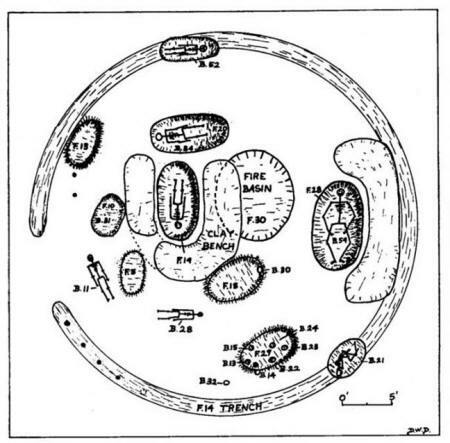 It may have been one of those excavated by Putnam, as he was the only person to dig at the site. 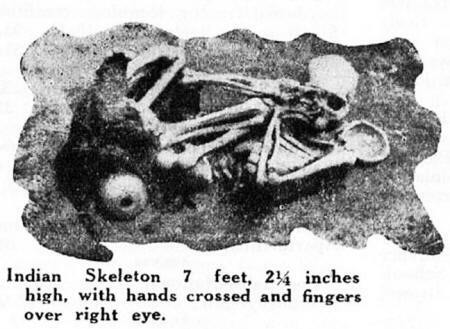 Ross first published this in his book A Tradition of Giants, and it clearly states it was from Serpent Mound on the postcard, but there is still debate as to where this photo of a 7ft skeleton was actually taken. Notice that the legs are cut off at the knees, so is “7ft” what we actually see, or is it an estimation if he had his lower legs and feet attached? Could it have been more like 8 feet tall if the shins and feet were intact? 7ft 2 inch skeleton with top part of skeleton burnt. Ground Plan of Cresap Mound showing Clay floor level and below. The giant skeleton is on the middle right. Dragoo published a photo of the actual skeleton in his book so there is no doubt it was authentic. Dragoo joins many other university-trained anthropologists and archaeologists who reported discovering skeletons over seven feet in length in burial mounds, often with anatomical anomalies. This account from The Worthington Advance (November 18, 1897) describes the ethnological work of the Smithsonian Institution’s Division of Eastern Mounds, and quoted the Director of the Bureau of Ethnology at the time, John Wesley Powell. The image below accompanied the news report. “It is a matter of official record that in digging through a mound in Iowa the scientists found the skeleton of a giant, who, judging from actual measurement, must have stood seven feet six inches tall when alive. Illustration showing the excavation of a giant skeleton. “…he turned up the complete skeleton of an 8 foot giant. Les Eaton on the floor next to the 8-foot skeleton. Miamisburg Mound is believed to have been built by the Adena Culture, anywhere between 1000 to 200 BC. It is the largest conical burial mound in Ohio, once nearly 70 feet tall (the height of a seven-story building) and 877 feet in circumference. Hugh investigated this site in September 2012 and after talking to some researchers at the local historical society, he found there were other skeletal remains reported in the nearby area. 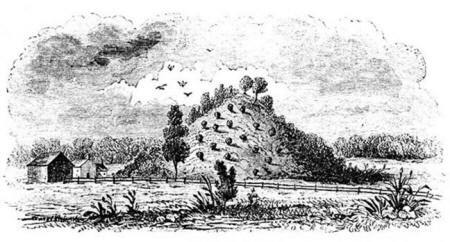 Old illustration of Miamisburg Mound. 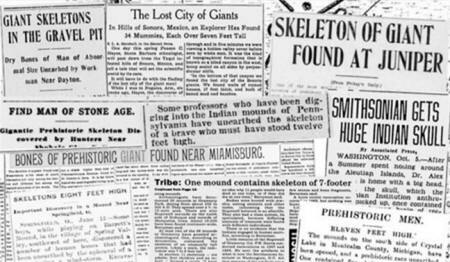 “The skeleton of a giant found near Miamisburg is the cause of much discussion not only among the curious and illiterate but among the learned scientists of the world. “The authenticity of the skull is beyond any doubt. Illustration of over 8-foot skeleton discovered near Miamisburg. This fascinating discovery reports on a giant mummy found in San Diego (that is currently believed to be a hoax). although they later claimed it was a hoax. The fact that it took that long, and after spending $500 to acquire it, plus the fact that it was “carefully inspected” by experts thirteen years earlier does suggest there may be more to this story than meets the eye. Interestingly, Aleš Hrdlička, joined the Smithsonian in 1903, right in between the discovery and the final debunking. He was not interested in giants and made a concerted effort to eradicate them from the historical record. It is also interesting to note that the Director of Prehistoric Anthropology, Thomas Wilson, and the ethnologist in charge W.J. McGee, were both involved in this story, and were obviously keen to make sure the Smithsonian got it back to their headquarters at an immense cost ($500 in 1895 equates to $14,285 today). But why would they bother doing that if it was simply a sideshow hoax? The Channel Islands off the coast of California have turned up numerous oversized skeletons. The story is intriguing and controversial, and it stars amateur archaeologist Ralph Glidden and his bizarre museum, but before the main act, a German naturalist got the story going in 1913. 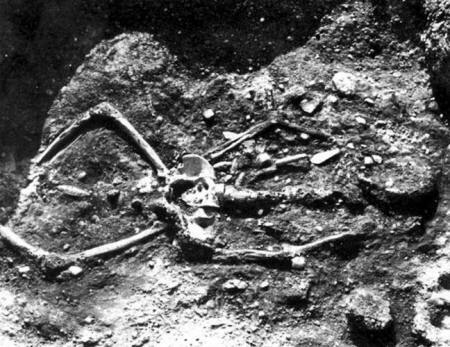 Amateur archaeologist Ralph Glidden unearthed and collected a total of 3,781 skeletons on the Channel Islands between 1919 and 1930. 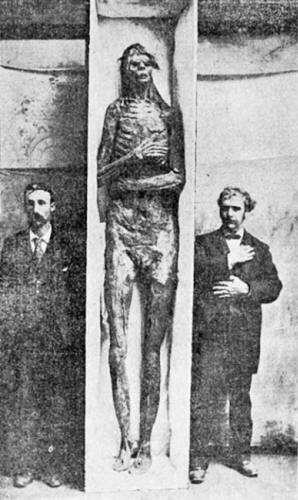 The skeleton in the picture is 7ft 8 in example. 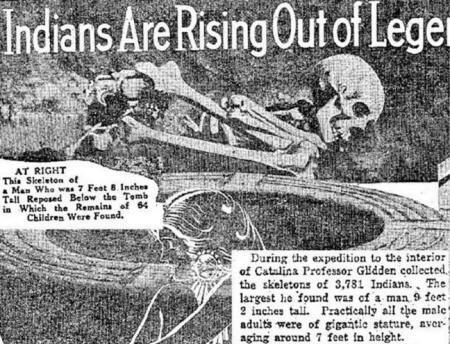 As part of Search for the Lost Giants, Jim and Bill Vieira visited Catalina to investigate the contents of the box, and indeed there were photos of hundreds of skeletons and skulls, excavations, artifacts, and burials. They also uncovered an account of a 28-inch femur unearthed by Glidden on San Nicolas Island reported by the judge of Avalon, Earnest Windle. This would make the skeleton over 8 feet tall. An over 7-foot skeleton found on Catalina Island. Skulls of giants with cranial deformation. During the filming of Search for the Lost Giants, the site of the cave was investigated. It had been flooded with the damming and creation of Beaver Lake between 1960-1966. Bill Vieira and professional scuba diver Mike Young dived into the lake and found a huge shelter cave believed to be the site of the skeletal finds. While a 70ft stone wall was found at the entrance of the cave, showing likely human habitation, no more clues were forthcoming. “While the historical features of the Ozarks held our attention, by far the most fascinating discovery was one made by an aged recluse and naturalist who for ten years had lived in a shelter cave near where we camped. ‘Dad’ Riggins spent much of his time digging in the ashes which form the floor of many of these caves. 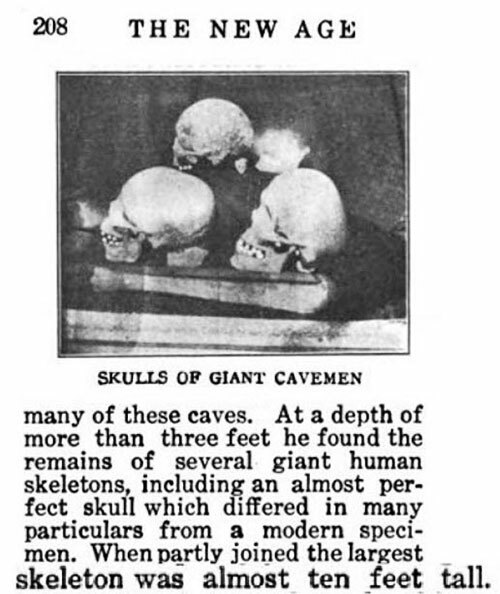 At a depth of more than three feet he found the remains of several giant human skeletons, including an almost perfect skull which differed in many particulars from a modern specimen. When partly joined the largest skeleton was almost ten feet tall. This short report re-emerged with a broader range of details in 1833 and now various authors and websites repeat the same story. Soldiers digging a pit for a powder magazine at Lompock Rancho, California, hacked their way through a layer of cemented gravel and found a 12ft sarcophagus. 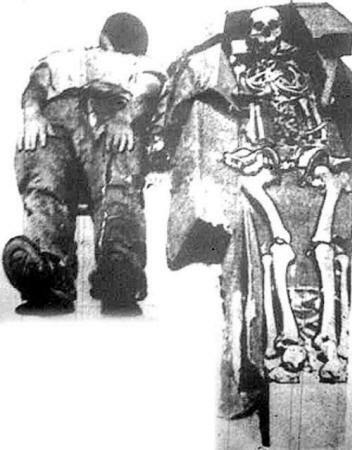 The skeleton of a giant man about twelve feet tall was found inside. The grave was surrounded by carved shells, huge stone axes, two spears and thin sheets of porphyry (purple mineral with quartz) covering the skeleton. These were covered with unintelligible symbols. He had a double row of teeth, both upper and lower. The soldiers consulted a local tribe of Indians, who after going into trance, exclaimed they were geographically displaced Allegewi Indians from the Ohio Valley area. When the natives began to attach some religious significance to the find, authorities ordered the skeleton and all the artifacts secretly reburied. No further information is available so it is impossible to verify this information, but numerous other skeletons of this height have been reported in such newspapers at The New York Times. Two further 12ft examples were reported in Jeffersonville, Kentucky ( The New York Times, May 22, 1871) and Barnard, Missouri ( The Providence Evening Press, September 13, 1883). 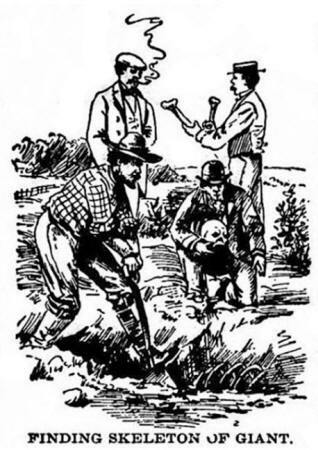 Furthermore, a 13ft example was said to have been unearthed in Janesville, Wisconsin (The Public Ledger, August 25, 1870) and even bones that were estimated to be from a skeleton 14ft tall at Etowah Mounds (The New York Times, April 5, 1886). These are all well out of the normal range for humans but are worth noting here as these immense sizes pop up again and again in well-respected newspapers. It was estimated to be 18 feet tall, and the bones were being prepared to be sent to New York. Clearly, however, this could be an exaggeration, as 18ft is unheard of in the historical record, but the matter-of-fact description is intriguing. Interestingly the discovery was reported to be buried 12 feet below a mound, so it could suggest a deep antiquity, however tall he was. 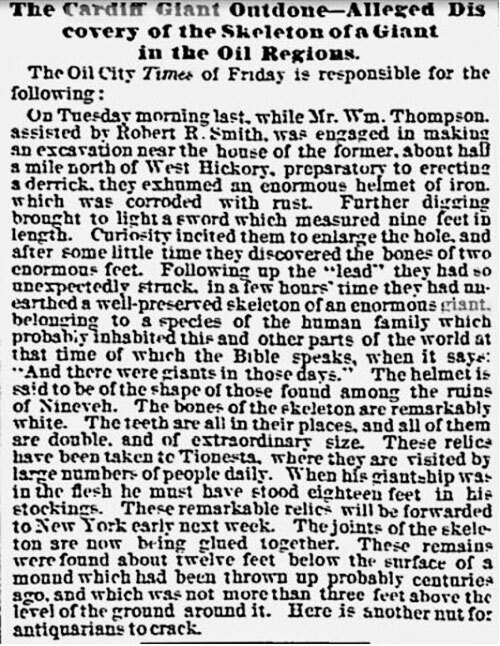 The report from 1870 describing an 18-feet-tall giant skeleton. We hope this tiny selection of accounts leaves one realizing there may be some truth to these reports (although numbers 9 and 10 cannot be verified, and they are well beyond the established scope of human height). The genesis of the North American giants is shrouded in mystery, but we believe that they were involved in the sophisticated Mound Building cultures of the Mid-West, as royal tombs with reported enormous skeletons were often found within them. There are many Native legends that place them in the era of the Megafauna (mammoths, mastodons, sabre-tooth tigers etc.) at around 13,000 years ago. There are dozens of oral histories that revere them as gods, and sometimes as fearsome cannibalistic warriors. Great wars were said to have taken place between these titans, and prehistoric battlefields with oversized bones and weapons were frequently reported by early colonial farmers. Eyewitness accounts of live giant giants were reported by English and Spanish explorers and even some of the early presidents. …as well as the Rosicrucians and Freemasons all regarded giants as a reality. 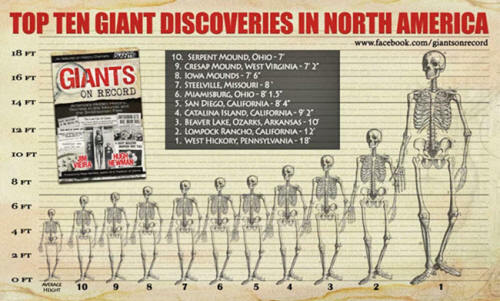 The origins of the North American giants are hotly debated by independent researchers, academics and skeptics, but there is now enough data to begin serious research into the subject. We cover all the theories of their origins in our new book, ranging from the Denisovans of Siberia to the Nephilim of the Bible Lands. There is also compelling evidence that the giants may have originated within the Americas. Hundreds of Native American creation myths and oral histories attest to this, with the giants being mentioned in the stories from remote times. One example can be found in the writings of Tuscarora Indian David Cusick in his book ‘Sketches of Ancient History of the Six Nations’ (1825). He states that when the Great Spirit made the people, some of them became giants. However, most people don’t believe in giants, but rather scoff at the idea, saying it’s all just folklore that got mixed up and sensationalized by newspaper journalists. Now is the time for academia to take a look at this data, and to investigate what really happened at the Smithsonian, as an important chapter in human history is on the verge of being lost forever. Are Jewish communities to ‘annex’ north London?